A few…. holy cow…. 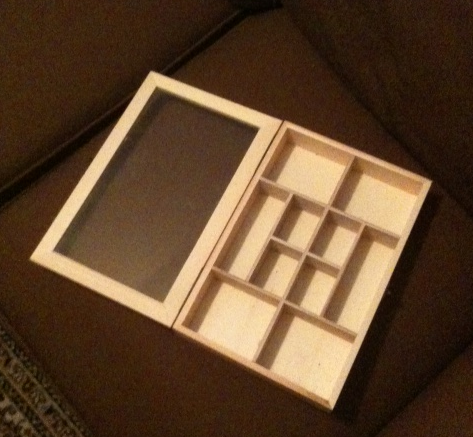 almost a year ago now, I bought two small curio cabinets with the intention of doing something creative. And then something shiny happened and forgot completely about them. I left them in their bag and placed them under the desk for future use, only something always came up for me to do instead. 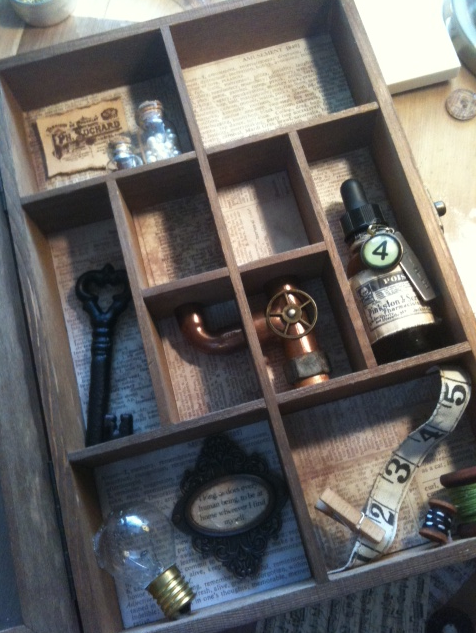 That’s the curio cabinet in it’s natural state. It has possibilities!! All the little boxes got me thinking about all the little findings I have to fit inside them, each box telling a little story of its own. I kept thinking of what tableaux I could make in each section, the Steampunk screaming at me to go in that direction, but the romantic in me also prodding me to do something a bit more feminine. So far, this is what I have. Yes, the bottle of poison has charms that say “4” and “Life”. I’m a sick person, I admit it!! But the juxtaposition was too delish to pass up. I keep lightbulbs, washers, nuts and bolts, any keys I find, wire, even screen mesh for use in my altered stuff. I can’t really call it art, though it is artistic. I do know one thing, though. I won’t end up owning it. I seldom keep the stuff I make. I can count on one hand what I have kept for myself!! But the joy is in making it, and in the giving. I just hope it finds a loving home. 38 Comments	| tags: hobby, under-my-skin, whistle-while-you-work	| posted in Fun Stuff, Project!